Click the button below to add the Strategic Angler Walker to your wish list. The mullet (family Mugilidae) is found worldwide in coastal temperate and tropical waters and are a favorite bait fish for top chain predators. 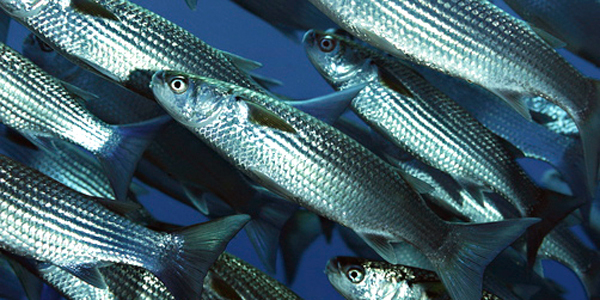 Mullet are often seen in shallow water in dense schools where they feed on plankton and algae. Their body profile is dense and almost cylindrical, and when startled, they can jump a few feet in the air. During an attack, mullet will scatter in all directions resulting in a scattered bait ball. Often enough, you will see a lone fish zig zag across the surface of the water because it was either stunned during the ambush or is trying to confuse the predator by darting in different directions. This action immediately triggers a predatory response, the perfect presentation to hungry eyes. The WALKING series lure floats head up and tail down at rest. 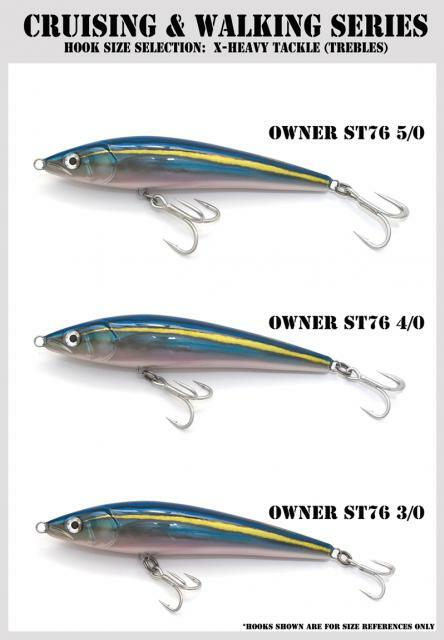 The lure responds with input from the angler to control its side to side surface action. Action: Top water zig zag with rod work (walk the dog). Diving bubble trail with rod sweep. Walking the Lure - The Walking Series lure is the perfect weapon of choice during a mid or topwater feed. Twitch and work the rod tip with a downward motion. The lure will respond with a zig zag surface skim while the tail sits in the water. The splashes generated by the lure triggers a frenzied feeding response resulting in spectacular blowups. Sweep and Pause – Sweep the rod tip all the way from right to left and then pause. Retrieve the line with a few cranks of the reel while returning to the original position and then repeat. The sweeping motion makes the lure dive with a trail of bubbles and surfaces head first at rest. During the dive, the lure will roll under water, exposing its flashy sides and pearl belly. This visual display triggers the feeding response of the predator so hang on during the pause. Strikes happen. 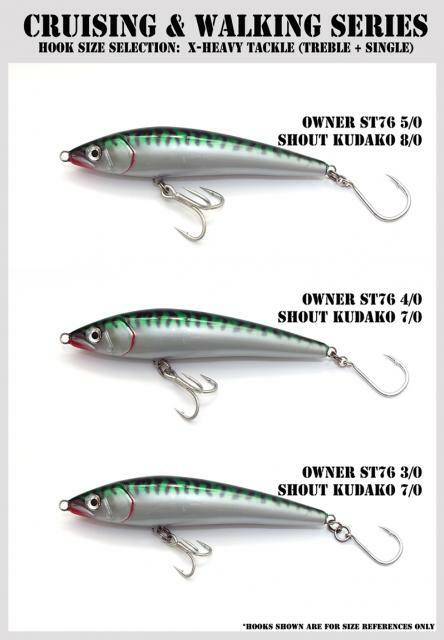 Swim and skim - Keep the rod tip down to swim the lure just under the surface with an erratic left/right/up/down motion. Varying the retrieve speed will enhance its erratic swimming nature while keeping the rod tip down. Retrieving the lure with the rod tip up will create a surface skimming action, just like flying fish or ballyhoo breaking the surface. Pausing the retrieve after skimming will mimic an injured ballyhoo or flying fish that has just landed. 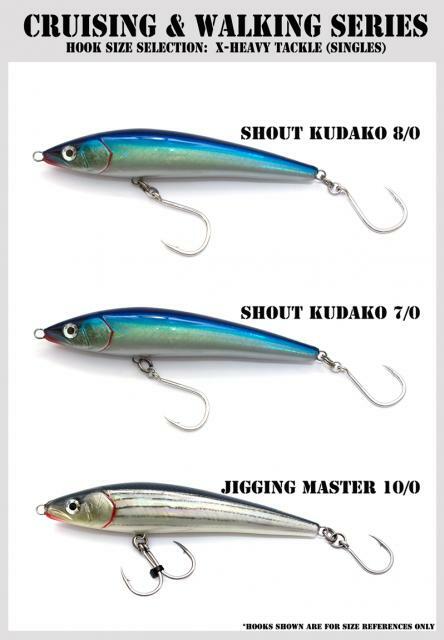 If you are looking for the hooks, you can find them here. If you are looking for the split rings, you can find them here. We reckoned #9 or #10 size split rings, depending upon hook size.